allow visitors to experience camp life and participate in several activities performed by soldiers of Johnston’s Army. Events include reenactments, encampments, stagecoach rides (Monday 12pm – 2pm), firearm and cannon demonstrations, marches, drills, 1861 period games, and photos in period uniform. The events will be conducted 10 a.m. to 4p.m. on both days. All events are free of charge. Standard museum entrance fees of $2 per person or $6 per family still apply. Food concession will be available to purchase at the event. was recalled back east in 1861 for the Civil War emergency. Today, the park museum houses artifacts and exhibits from this historic event. 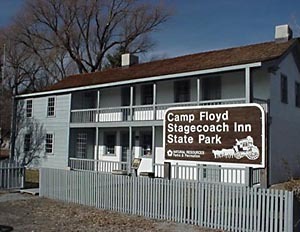 Experience the history of Camp Floyd. Visit www.stateparks.utah.gov for a list of this years special events and programs.